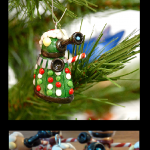 Need some super kawaii Doctor Who Christmas ornaments? Each one is about the size of a chicken egg, and are handmade with sculpey by me. They’re lightweight, but sturdy enough that they won’t shatter if you drop them. There are Adipose, Ood, Cybermen, and Christmas Daleks. The daleks come in gold, green and red. If you’re interested in buying any, send me an email at kaijusensei@gmail.com. They’re $15 each, shipping depends on where you live.